Room 237 may be the first documentary of its kind. The film explores fan readings of the seminal 1980 horror film, The Shining, by combining the footage of the films of Stanley Kubrick with the voiceover explanations of five fans explaining their theories. Each reading can be supported, but some pieces of evidence feel like Rorschach ink blots, and all five theories rely heavily on the concept of the auteur. Ultimately, Room 237 fascinates more for the ways it reveals the reading practices of fans than for any great light it actually shines (no pun intended) on the text itself. The five narrators each explain a theory about the underlying meaning of The Shining. Two theories align the bloodshed in the film with acts of genocide, with one fan claiming that the film is about Native American genocide and the other arguing for the Jewish Holocaust. The third reading connects the text with the myth of the Minotaur, while another fan suggests that the film can be read as Kubrick’s admission to staging the Apollo 11 moon landing. The final reading argues that the film grapples with sexuality and, like all of the other readings, points to images of repression to forward its case. 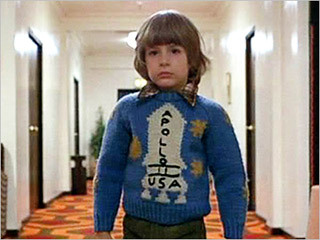 The interpretations on display in Room 237 vary greatly in terms of validity. The Native American genecide reading may be the most plausible due to the Overlook Hotel’s western decor, lines of dialog (“White man’s burden!“), and the hotel’s location upon an Indian burial ground all lending credibility to the concept. The minotaur reading also seems valid due to the actual labyrinth featured in the film and the formal similarities between the tracking shots within the labyrinth and the Overlook Hotel. The scene in Room 237 certainly supports the reading around repressed sexuality; however, I’m less convinced by the Holocaust argument and find the Apollo 11 theory laughable, as these two readings rely primarily upon minutiae, rather than upon plot points. Therein lies the fascination of Room 237: all five fans point to incredibly specific details from the mise-en-scene as clues for their solution to the puzzle that is The Shining. Everything from a can of Calumet baking powder, to a German typewriter, to an Apollo 11 sweater becomes a sign hinting at much deeper meanings within the text. Danny’s Apollo 11 sweater. Image from nationalreport.net. The most absurd examples of hyper-attention to detail include a viewer who insists that a cloud resembles Stanley Kubrick’s face, another who compares a skiing poster to an image of a bull, and my favorite would be the paper tray that looks like a phallus. These examples require the keenest attention of the reader to have noticed such abstract uses of the mise-en-scene. They demonstrate who viewers interpret details creatively to support a unifying theory of the film. Such specific, detailed readings also rely heavily upon assumptions about filmmaking that overestimate the artistic control of the director in the crafting of a film. The fans describe the pains taken by Kubrick in the placement of objects, and while it’s true that such details can be significant, the idea that the director has control over all of these specifics overlooks the fact that film requires collaboration: art directors, costume designers, set directors–all take part in the decision-making process. In a film of The Shining’s complexity, there are just too many details for all of them to have been intentionally chosen by the director. By superimposing the reversed version over The Shining, fans demonstrate the power of synchronicity and the symmetry of narrative. For me, this use of the text proves far more interesting than the tenuous possibility of an all powerful director placing objects in front of the camera to communicate a message. For this reason, Room 237 as a whole is more compelling as an exploration of fan appropriations of text, rather than its elucidation of The Shining‘s overarching meaning. It demonstrates that the viewer, as much as the director, creates meaning when reading a film.